Ask anyone who knows me. I am a VERY outgoing person. Extroverted? Yes. A less known fact is that I hate uncertainty. I need to know what is happening. And when. Without that, chaos. 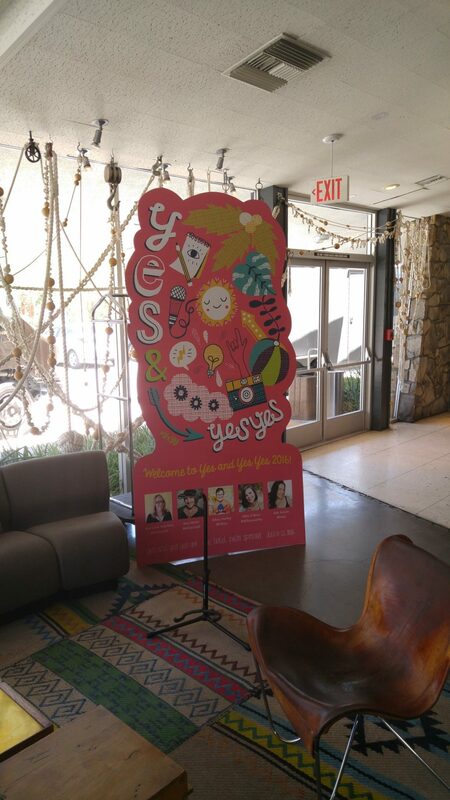 Yes and Yes Yes (@YxYY on Twitter) is a gathering of “thinkers/futurists/nerds/weirdos” that happens every July in Palm Springs, California. The gathering takes over the entire Ace Hotel with a fervor that is unmatched in nature. Everywhere you look there are spontaneous combustions of creativity and conversations. Strangers are easily striking up conversations, asking questions and sharing their passion. This is one of the reasons I love this event. Here is the catch. There is no agenda. There is no schedule. Only an app that you can look at to see what events people have decided to create. “What Books Are You Reading in Room 1234 at 2:30”. “Serial Cereal in the Commons from 10 to 12:30” is scrawled on the sidewalks. It is a restrained chaos. This is the part I hate. AND the reason I keep coming back. See, this is good for me. Embracing the uncertainty. Allowing serendipity to carry me. There IS a path here, you just can’t see it until you are already down it. Only in hindsight do you see the path your weekend took. As I am moving through the weekend I constantly feel I am missing something. There must be something else going on that I will regret missing. Then, when I look back, I see there was a path. And it was perfect. It was exactly as it should have been. Not one to quote Richard Bach without wincing, I hesitatingly will reference “When someone says it could have been worse I know it couldn’t have been any worse. Or any better. It couldn’t have been anything other than what it was.” (terrible paraphrasing here. I don’t want to lose my train of thought googling it so my apologies to Mister Bach). Only a third of the way through YxYY4, I am embracing that this event couldn’t be worse. Or Better. Because it is perfect for a control freak extrovert.